Granite installers often do not provide proper granite cleaning instructions nor provide proper maintenance for stone countertops. They’re not to be blamed. They just have never been instructed on the right way to clean granite countertops. Your granite contractor may recommend using Windex on granite countertops or perhaps, conveniently, dishwashing soap for daily care of your granite countertops. But don’t do it! Here’s some direction on the RIGHT way to treat your granite counters. What granite use precautions to take. Some simple precautions can eliminate many of the maintenance issues possible with natural stone tops. You should set glasses on coasters, especially if they contain colored juices. Many foods can dull, stain, or etch the surface of stones such as limestone and marble. Avoid acidic foods touching these stones. Use trivets or mats under hot dishes and placemats under china, ceramics, silver, or other objects that can scratch the surface. Granite counters are typically not affected by hot dishes of hot pots and pans. Knives usually will not harm granite either. Other stones can scratch though. If you do spill a potentially staining substance on your countertops, blot immediately with a paper towel. Be sure not to wipe the area, as this will only spread the spill. Clean the area with mild soap and water, rinsing several times. Then dry with a soft cloth and repeat the procedure if needed. It’s rare that granite will stain, however, unsealed porous stones (typically light color stones) can stain. If you do get a stain, you have a means of removing it. See Granite Stain Removal for the tricks of the trade. Clean granite countertops with Windex? Occasional use of glass cleaner like Windex is convenient. But repeated, regular use can permanently damage your granite tops, with pitting, and more commonly, dulling the “shine” of your countertops. Also, the stain-blocking barrier of your granite sealer could be affected by use of glass cleaner. Learn more at How To Seal Granite Countertops. With calcite-based stones like marble, limestone, and onyx, the potential damage is even greater. So why use glass cleaner to clean granite when you have other alternatives made specifically for cleaning stone counters. What impact will dish soap have on granite countertops? Dishwashing soap is probably the most convenient cleaner you’ll reach for in the kitchen for granite cleaning. Dish soap shouldn’t cause permanent damage to your stone tops, but you’ll be left with a soapy film on the stone surface. For a while, you won’t notice it. But the build-up of soap film from repeated use of dish soap for cleaning will cause your granite counters to be noticeably less shiny. Restore granite shine by removing the built up soap scum with specialized soap film remover. Why spend all this time to keep your stone tops looking great when there are cleaners made to clean granite countertops without leaving streaks or films. First, NEVER use seemingly convenient cleaning products such as dish soap and glass cleaner. Don’t use home-brewed mixtures like water and vinegar to clean granite countertops. Do spend a little extra money for cleaning products made specifically to clean natural stone. It’s your best bet considering your granite investment. I have personally installed, cleaned, and sealed more than 1,000 countertops (until I realized I wasn’t suited for carrying thousands of pounds of stone tops up flights of steps). On every job, my team always gave the countertops their final cleaning and de-greasing with denatured alcohol. Denatured alcohol cleans granite, removes any grease from fabrication, transportation, or human hands. The result is a clean, original shiny surface, ready for granite sealer. Clean your natural stone tops daily with a specialized cleaner. With many years of testing, my recommendation is MB Stone Care MB-5 Marble, Granite and More Spray Cleaner. 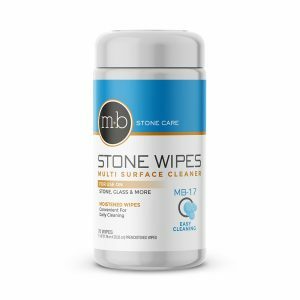 In fact, MB-5 is provided to all our customers as part of a complimentary stone care kit when we install their new countertops. 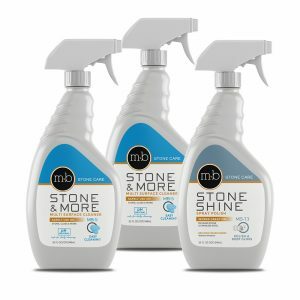 We also show how to clean their granite with MB-5. You can use MB-5 full strength on the cooking and eating areas and dilute it 1:1 with water in less used areas. If you’re concerned about disinfecting countertops where you handle raw meat, consider using stone disinfectant or a UVC Light Wand. Actually, disinfecting raw meat handling areas should be considered on any countertop material, even stainless steel. For calcium based stone such as limestone and marble, be careful not to use acidic products like vinegar or lemon since these can “etch” the stone tops. Also, avoid scouring or abrasives on any stone tops because you may scratch the surface. Cleaning granite is easy and should only take you minutes each day to keep your granite looking brand new for years. Isopropyl rubbing alcohol cleans and shines your granite countertops in minutes. Careful because it evaporates quickly and will be gone before you know it. I’ve seen recommendations which combine rubbing alcohol, a couple of drops of dishwashing detergent and water. As I mentioned before, this may be cheap, but detergent residue may be left behind. Try both, rubbing alcohol alone or rubbing alcohol, detergent, and water. You be the judge. EPA certified “Green” granite cleaning. 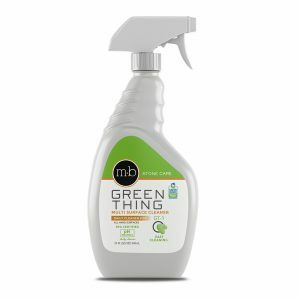 MB Stone GT-1 is a neutral pH, ready-to-use, EPA Certified “Green” cleaner, formulated to safely and easily clean honed or polished marble, granite, limestone, slate, travertine, Corian, ceramic, porcelain, laminate and also painted wall surfaces. GT-1 is formulated to be environmentally compatible and sustainable. It’s streak free and dries quickly. This fast evaporating, powerful, daily cleaner works quickly and cuts through soils on all hard surfaces. Also works great on windows, mirrors, and shiny metal fixtures.